It may generally be considered the year 2010 but as far as the lunar calendar is concerned, it's already 4,708. Auspiciously, it's the year of the metal tiger (or as a Chinese friend would rather call it, the golden tiger). The Chinese culture is so embedded into the Filipino's consciousness, we Pinoys look forward to the Chinese New Year and the tikoy (Nian Gao or glutinous rice pudding) that comes with it. 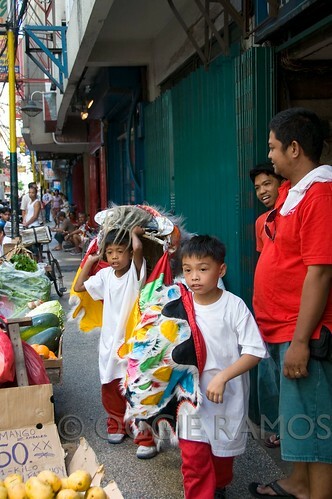 Not really surprising considering our Manila Chinatown is the oldest in the world. 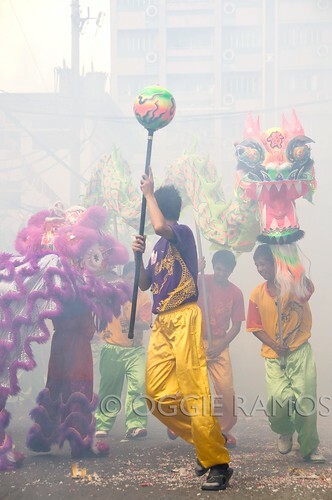 Along with the rhythm of loud drums and the explosion of firecrackers, the traditional dragon and lion dance is performed along the busy streets of Binondo to drive away the evil spirits and usher in a new year of prosperity. Funny observation I overheard from a bystander: "Chinese New Year dragon dance yan pero ang nagsasayaw, mga Pilipino," (They're performing the Chinese New Year Dragon Dance but the ones dancing are Filipinos). Makes me think how much of our culture have been permeated by Chinese influences so much so that it's pretty hard to think the lumpia (spring rolls) or pancit (noodles) we always have for meals is really Chinese in origin. I woke up late for the early PNR train going to my mom's place in Manila but serendipity led me early enough to Manila Chinatown before the traffic snarls up and the dragon performances go into full swing. I espied the performers of Wong's Lion and Dragon Dance Group alighting in front of the Basilica Minore and followed (stalked?) them as they went from a private residence near Elcano to Eng Bee Tin right beside Binondo Church. Even the young kids got into the act with their own dragon and lion dance, going from establishment to establishment, hankering for angpao (red envelope containing money donation). 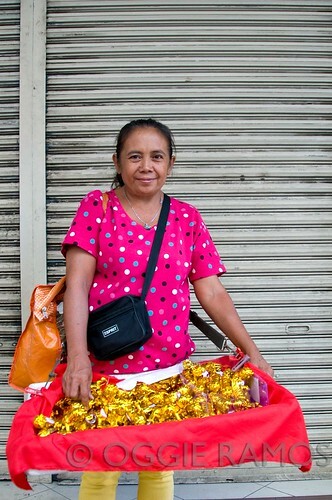 Because Chinese New Year's day fell on a Sunday, Binondo is alive and bustling even in the side streets. Lucky charms were aplenty -- from metal tiger ornaments to small pineapples. The lines for tikoy were long. All sort of round stuff like native oranges were much sought after as symbols of fortune and prosperity (coincidentally, all the food I ate at Shin Din Kha along Benavidez were either round or came in round containers). 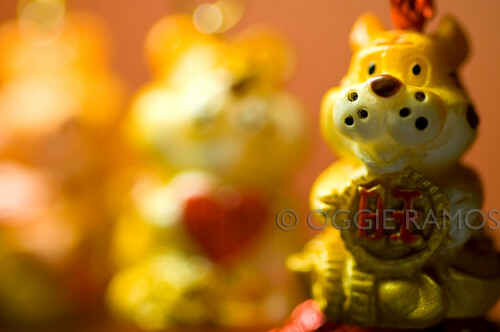 Lagalog, who is working on yet another Sunday, wishes all his readers, Kung Hei Fat Choy! bilis bai! i too saw the woman in the second photo. i like the first shot. had to hurry back to makati again bai to continue working on my submission kasi. I hope you had a nice weekend of Dragon Dance & a romantic Valentine's Day. Nice pictures... just put you in the right mood ! Hey! Kung Hei Fat Choi! Oggie: What a neat celebration. Sidney, no regrets though since I have a good slice of the action. Fortuitous Faery, Kung Hei Fat Choy to you too.